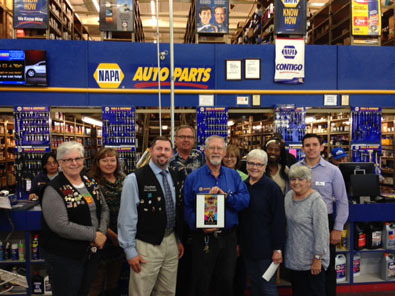 Members of the Artesia Chamber of Commerce and Artesia Trailblazers join staff of NAPA Auto Parts after naming the local store the Business of the Month for November. Pictured from left are Susie McCaw, Vickie Grousnick, Jesse Brownfield, David Grousnick, Steve Anderson, DeNette Wallace, Cindy Anderson, Clara Mauritsen, Nancy Jorren and Sam Hagelstein. Steve and Cindy Anderson have owned NAPA in Artesia since 1992. The business was previously located behind Bennie’s Western Wear before moving to its current location at 111 W. Richardson Ave. The store is open from 7 a.m. – 6 p.m. Monday through Friday and 7 a.m. – 1 p.m. Saturdays, and may be contacted at 746-3597.